This is an easy recipe for a classic sausage breakfast casserole that has been modified for the pressure cooker. This Instant Pot Breakfast casserole is quick and easy to prepare, making this hash brown egg bake perfect for busy mornings. French Toast Casserole and Hashbrown Breakfast Casserole are two of my family’s favorites–and they happen to be two of the more popular recipes with my readers. 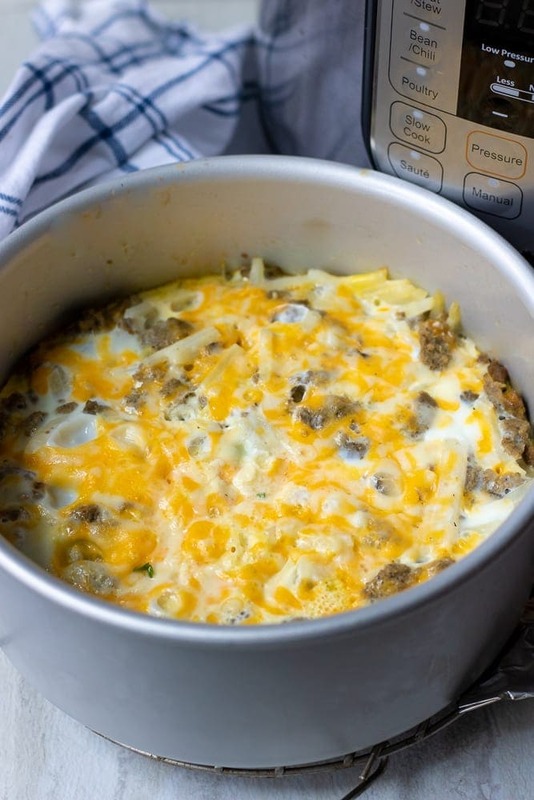 The great thing about breakfast casseroles is that they can be prepped ahead of time and baked in the morning for an easy, hearty breakfast perfect for a crowd. But when using the Instant Pot, a breakfast casserole can be ready in less than 30 minutes from start to finish. Hash browns, sausage, eggs and cheese are the stars in this easy gluten free breakfast dish. 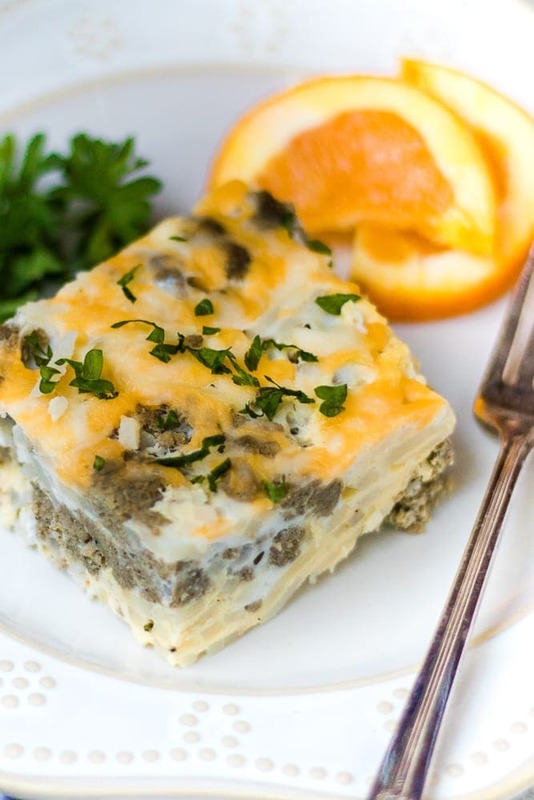 This breakfast casserole is hearty, filling, cheesy, and EASY to make. Turn pressure cooker to saute and let heat. Add in sausage and cook until browned and cooked through. 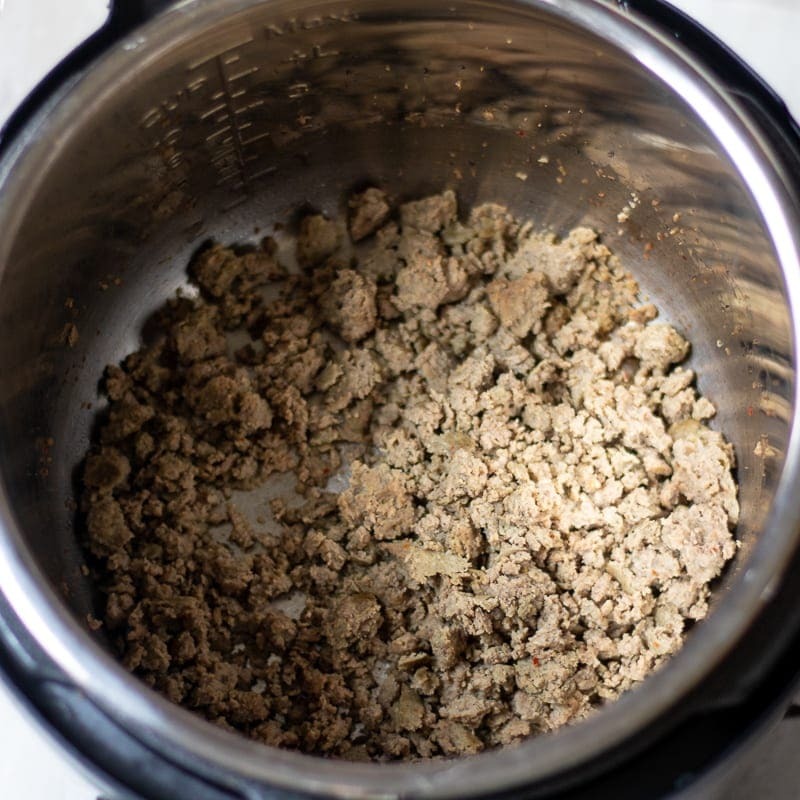 Remove cooked breakfast sausage from instant pot. Add in 1 cup water to inner pan of instant pot and add trivet into pressure cooker. Whisk together eggs with milk and seasonings until well combined. Lightly grease an oven safe 6 inch by 4 inch baking dish. Cover the bottom of the pan with defrosted hash browns. Sprinkle sausage over hash browns. Pour eggs over sausage and hash browns. Tightly cover baking dish with foil. Place casserole on trivet in pressure cooker. Cook on High Pressure for 20 minutes, using manual button. I like to use Turkey or Chicken Breakfast Sausage for this breakfast casserole, but pork sausage or even cooked bacon is a great option. It is best for your hash browns to be defrosted for this casserole. Use any sharp, melting cheese to top this casserole. I think cheddar, Colby, or Swiss are perfect options for this casserole. 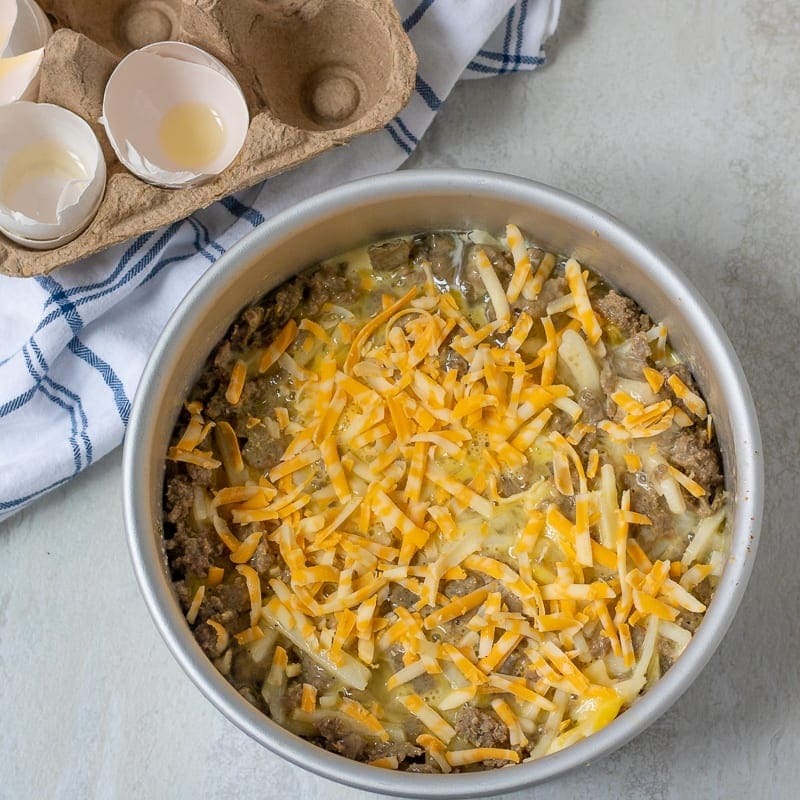 An easy breakfast casserole made in an electric pressure cooker with hash browns, eggs, sausage and cheese. Turn pressure cooker to saute and let heat. Add in sausage and cook until browned and cooked through. Remove cooked breakfast sausage from instant pot. Add in 1 cup water to inner pan of instant pot and add trivet into pressure cooker. Whisk together eggs with milk and salt and pepper until well combined. Lightly grease an oven safe 6 inch by 4 inch baking dish. Cover the bottom of the pan with defrosted hash browns. Sprinkle sausage over hash browns. Pour eggs mixture over sausage and hash browns. Sprinkle with cheese and cover with foil. Place casserole on trivet in pressure cooker. Cook on High Pressure for 20 minutes, using manual button. Allow pressure to release manually for 5 minutes and then do a quick release and serve. I assume it would have to be a round dish? Hi Angie! I purchase my pans off Amazon and here is one I use (https://amzn.to/2DMSV25) But a pyrex glass dish works as well. Round is best as it fits in pressure cooker easiest. Absolutely!!! My original recipe is for the oven: https://amindfullmom.com/easy-hashbrown-breakfast-casserole/ It is just as easy and delicious! Enjoy! This is perfect! Always looking for new instant pot recipes. This is a great one to keep on hand Britni! Enjoy! I love this recipe! So simple and delicious! YAY!!! I love hearing that Nellie! Thank you! I followed the directions but have a ton of liquid still once I cut into it. Could this not be fully cooked or oil from cheese and sausage? Hi Liz, it sounds like your eggs did not set up…but yes, it could be because your sausage was oily. You can set under broiler to set the eggs up…just watch carefully. You could also cook for another 3-5 minutes on high pressure, it will not take as long to come to pressure the second time. I made this in my Silva Tools stackable pan. It wasnt done after 20 minute cook time and was still runny in the middle. I was really surprised. And thoughts on why? I have a 6 qt Ultra. Hi Shawna, it is more than likely that the pan you used is more narrow than the pan I use, making the depth of your casserole thicker. I would cook for another 3-5 minutes on high pressure to set the eggs. Sorry about that. if I double the recipe to put in a 7″/8″ round pan (I have an 8 qt IP) what do you think the cook time should be? Can I use a glass baking dish in the Instant Pot? Why could you not use the ip as the dish and cook it in the pot itself? Hi Carolyn! You always need liquid in the pressure cooker, if you were to put the casserole ingredients right in the pan, it would give you a burn notice and would not cook correctly. Loved it. Cooked it 5 min. Longer and it was not done. Cooked 10 min. More with 5 min. wait then released pressure. I put dried onion and lemon pepper in egg mixture. Used old fashioned hash browns. Thanks for recipe. Will be making often. I am so glad you enjoyed Barb and thank you for letting us know how you needed to adjust the cook time! Fantastic! Used 9inch pan with lid and was perfect! Will be an IP favorite! Thanks so much! YAY! So happy to hear that! Thanks Sylvia! I used frozen hash browns and added some frozen spinach. Mine took about 40 mins in a 6qt Instant Pot. Cooked 20 mins, it was pure liquid. Cooked 10 minutes more and only half of it had set, where the other half was still sitting in liquid. Cooked another 10 and it was done. The end result was delish! Hi Daryl! I am glad you enjoyed this casserole. I am sure the fact you used frozen hash browns and frozen spinach were the cause for the time increase–that would account for extra time for sure. Glad you kept cooking and enjoyed! Has anyone tried a 3qt instant pot insert in the 8qt instant pot for this dish? Would you adjust the cooking time at all for a Corningware dish? The size that fits perfectly into a 8 qt IP. Hi Jo! Usually a corningware dish is 1.5 quarts and the 7×3 pan holds about the same amount, so the cooking time should be the same. I hope you enjoy!